There are some houses it would be hard to just walk past without feeling compelled to sneak a closer look. 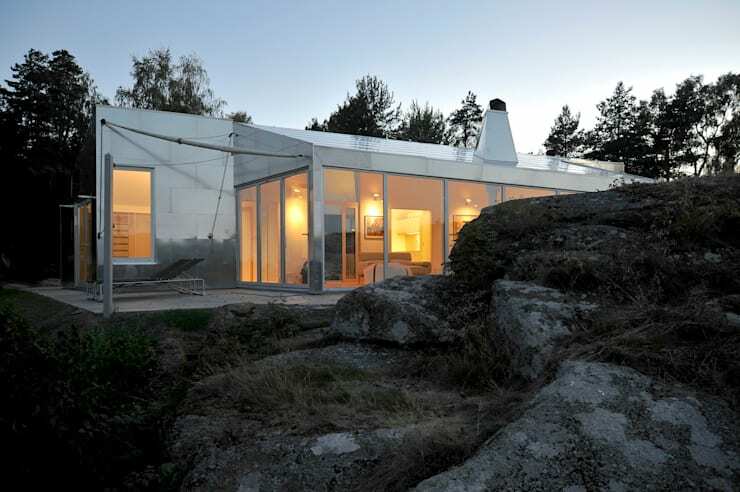 This Norwegian aluminium cabin is one of them. A rustic getaway with a difference, everything about it demands attention. The first impulse upon catching sight of it out of the corner of one’s eye might well be to do a double take; it’s not often that we see homes that are so, well, shiny. It would be easy to find your way home if you lived in the vicinity of this wonderfully conspicuous building. 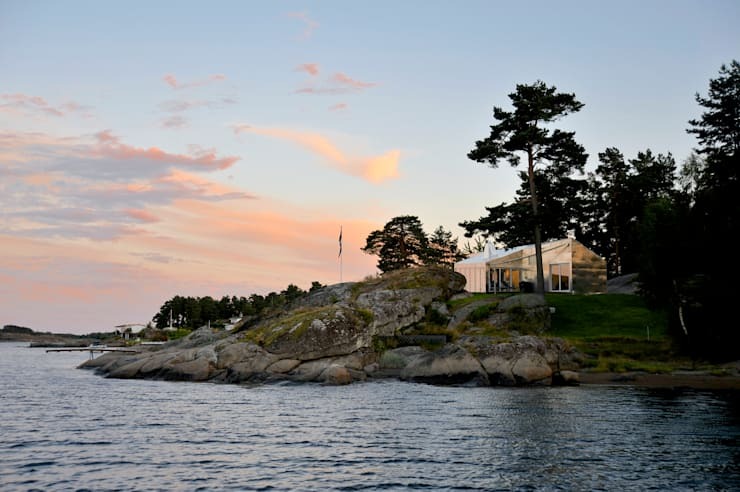 It may be at its most impressive viewed at dusk, as here, with its sharp angles jutting out against the dark blue sky, acting like a mirror to the moonlight. The very special choice of material is, of course, the most obviously unconventional aspect of this design, but it has plenty of more subtle qualities also worthy of comment. 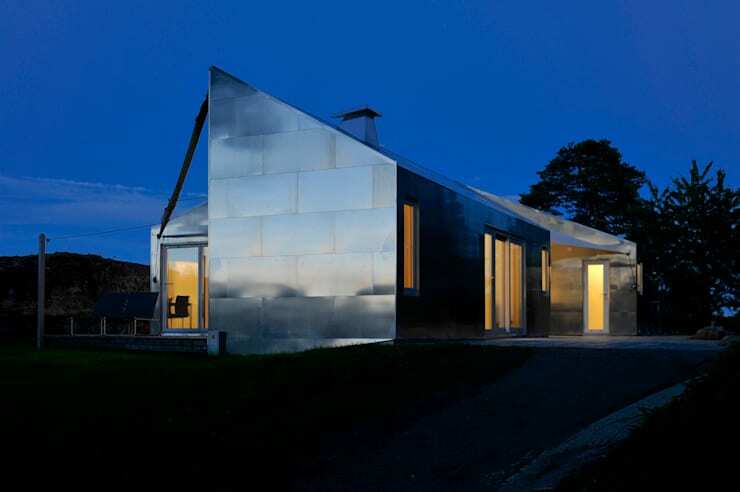 Note, for example, how the aluminium panels used mimic the pattern of stonework, while the sloping roof abruptly stops short in the middle, seeming to have been sliced in half. 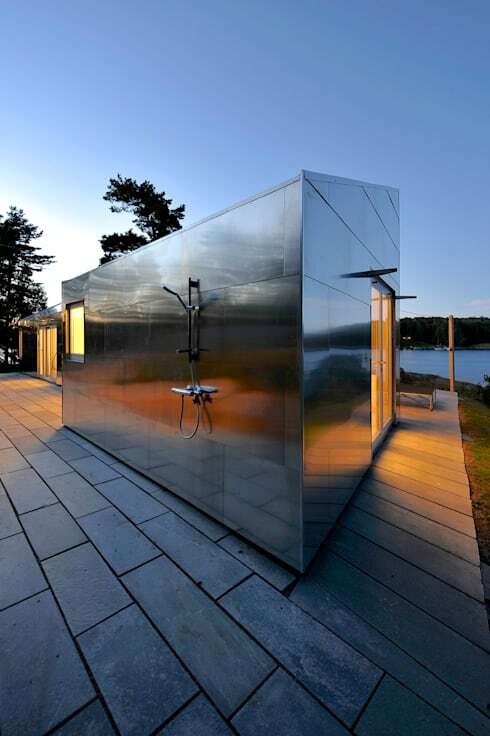 There are lots of unexpected quirks to explore here, above and beyond the striking aluminium siding. 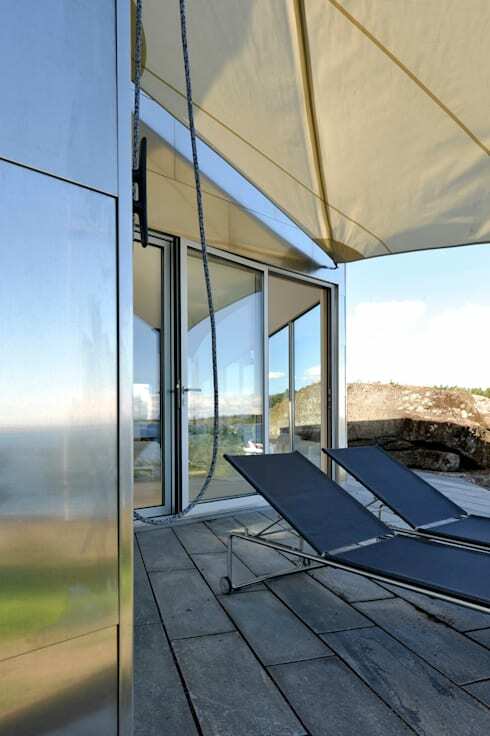 It’s likely that, by daytime, the sunlight bouncing off the sides of the building can be quite blindingly bright, so it’s just as well that the cabin comes with a retractable sun canopy to keep people safe while they lounge. The thick-cut slates of this flooring are the perfect companion to the cabin’s industrial exterior walls, carrying the same steely shades throughout the whole of the design. Seen from a new angle, the cabin reveals floor-to-ceiling windows that ensure the property looks even more astonishing at night, while being drenched with sunlight during the day. The rugged, rocky landscape surrounding the building offers a natural shield from prying eyes. 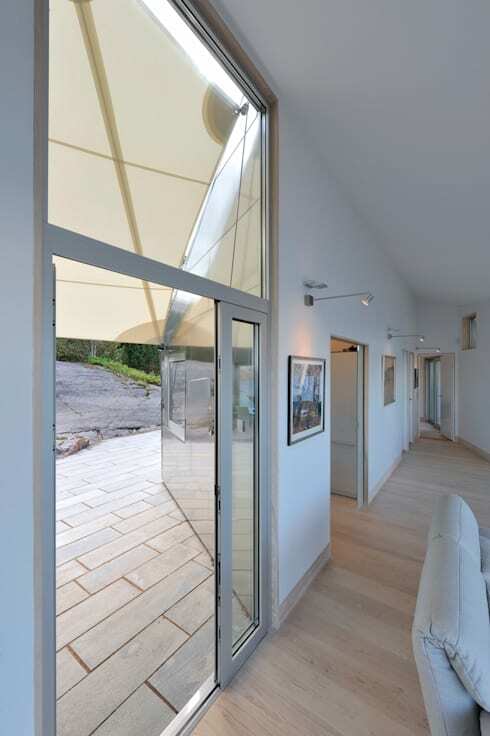 This image is the one which perhaps best accounts for the architects’ choice of material. 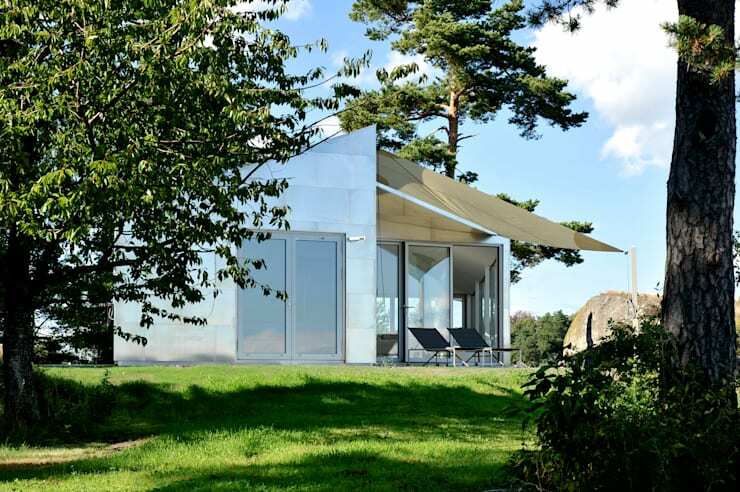 Quite apart from looking arresting in itself, the mirror-like surface of the aluminium captures and reflects the gorgeous natural shades of the Norwegian landscape as they change throughout the day. It’s almost like a blank canvas for nature to paint on. 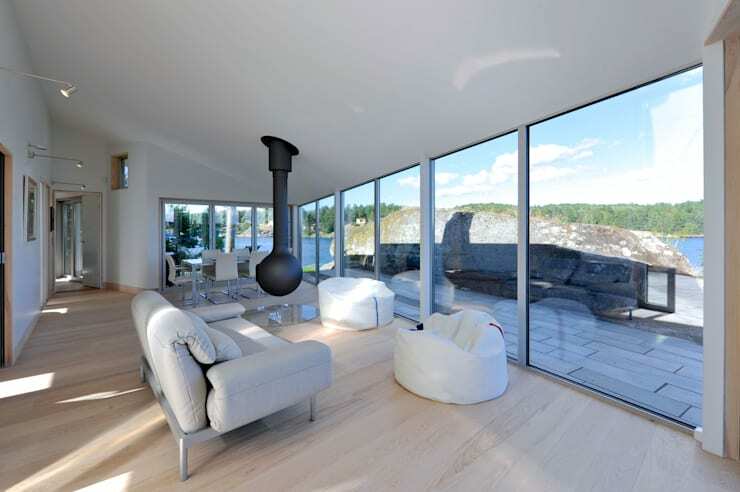 The sharp angles of the cabin’s exterior are, of course, a feature within as well, with the living room tapering away to a narrow point at its far end. The natural surroundings of the cabin are as much a feature of its décor as any of its man-made elements. This gorgeous view is therefore an integrated part of the living room, even more essential to it than any of the pieces of furniture. This eccentric little fireplace is just right for the living area. Anything more conventional would feel unduly obtrusive in the context of such an atypical home, while a hyper-minimalist design would seem at odds with the obvious reverence for the countryside, and for rural ways, that this architect feels. 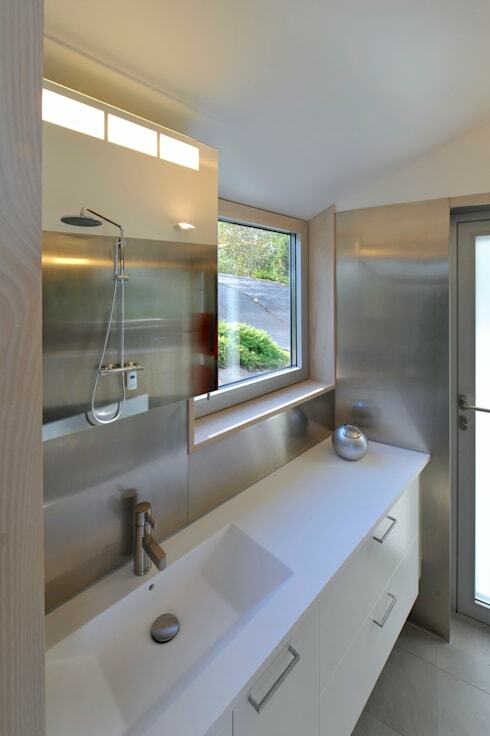 Although the walls of the living room are white, presumably to avoid aluminium overload, aluminium has been deemed appropriate for the bathroom. And you know what? It works, it really works; perhaps because it is a much smaller space. No need for a bathroom mirror, then. If one really wants to commune with nature, there could be no better way to do so than by showering outdoors in the morning. Preferably in winter. Preferably with ice-cold water. Fortunately, the aluminium cabin comes equipped. Would you live in this cabin? Why or why not?